It's Time to UP your Tug Game! Download our free guide and learn how to play a more effective game of tug! The tug was made of leather, roughly stitched, with two bright red handles fashioned from a strip of utility webbing. Being the MacGyver style, former Navy SEAL that he was, he opted to craft his own toy, proudly proclaiming “I’m not buying one of those. I’ll make it myself” when I encouraged him to get a tug for his newly acquired Belgian Malinois. True to form, the next time I saw him, he had fashioned a toy out of some old scraps of leather he had laying around. It was rough in design, lacking the clean lines that store bought toys had. But it was surprisingly well done and sturdy for his first attempt. “Nicely done,” I said as I examined his work. He smiled cautiously in response, taken aback by my compliment, fully expecting me to tease him about the misshapen toy. I didn’t tease him. I was legitimately impressed. Excited to show off his creation, he began playing a fierce game of tug with his Malinois. She was intense and loved the game, occasionally barking with excitement when the tug took too long to find it’s way to her. He’d present the tug, ask her to “Out!”, reward her, and they’d play again. Wash. Rinse. Repeat. They were having fun, lost in their game and tuning out the world around them. “Dammit!” he exclaimed part way through the game, letting the tug drop with as the words escaped his lips. His focus shifted to his hand and on it, I saw a tiny droplet of blood. I knew what happened. She had clipped his hand, traveling up the tug as they played and transferring from tug to flesh, catching him on his thumb. She held this trick up her sleeve for as long as I’d known her. Winning was the goal of her game and she knew how to do it. If she made her way to his hand, he’d let go … every … single … time. She was smart, and she’d figured out the game quicker than he did. I laughed, and in a moment the teasing commenced. We were friends. And it wasn’t uncommon for the two of us to joke relentlessly. He knew it was coming, and he braced for the assault. “Remember, put BOTH hands on the tug” I instructed. He knew this. But habit was hard to break. He did as he was told for a few repetitions, but soon, he found his old tendencies and in no time, he took a tooth to the hand once again. For dogs with drive, tug play can be one of the most valuable rewards a trainer can use to bring motivation to their work. However, it can be easy to get lost in the game and neglect technique, not giving a thought on how to deliver, present, and play with the toy in a way that is the most effective for both the dog and the handler. I see this illustrated every day as clients regularly reach out for help getting control over their tug-crazy dogs. “I get bit EVERY day.” they plead. In fact, over a dozen coaching clients I’m currently working with are struggling with their tug game. And they are only a small drop in the bucket. Problems in play are common. Dogs regularly either miss the mark entirely, clipping a hand in lieu of the toy, or they thrash so hard that it becomes an uncomfortable game to play. Dogs won’t “Out”, they won’t let go, and others travel on the toy, never securing their grip and eventually finding their way to flesh. What’s meant to be a fun game between dog and handler, evolves into a painful or frustrating endeavor. But here’s the thing. More often than not, these frustrations come from our own handling of the tug – not our dog’s technique. You see, there are mechanics to the game. Techniques and strategies. This isn’t simply a drop of the toy and congratulations, reward achieved. There’s more to it than that. And by knowing good technique, you can absolutely make the game fun again. 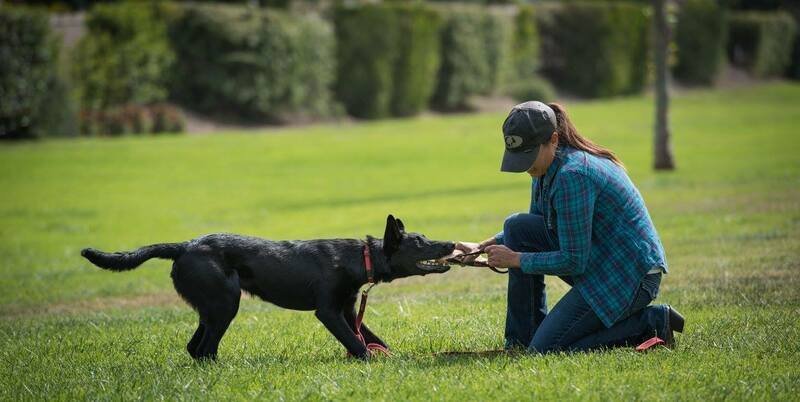 Here are the top mistakes that trainers and handlers make when playing tug with their dogs. Holding ONE side of the toy – Many people see one handled tugs and think that’s an invitation to hold only one side of the tug on their presentation and during play. But you’ll be better served to present and play with your tug flat and parallel to the ground, with both hands evenly spaced on the tug itself. Not only is this a more comfortable presentation for your dog, it also will prevent dogs from traveling on the tug, moving up and down to find a better grip. Holding the toy by the handles – When you are presenting your tug and when you are playing, unless you are experienced, holding the tug handles can be risky business. You control the handle. NOT the actual toy. And since the toy is what you want your dog to target, that’s the piece of the puzzle you need to own. It can be so easy for the toy to dangle and flail as you hold it by the handles. And it can be even easier for your dog to miss the target as it moves more readily when you hold it by the handles. But by gripping the actual toy itself, you’ll gain control in your presentation and you’ll better control your dog’s entry. 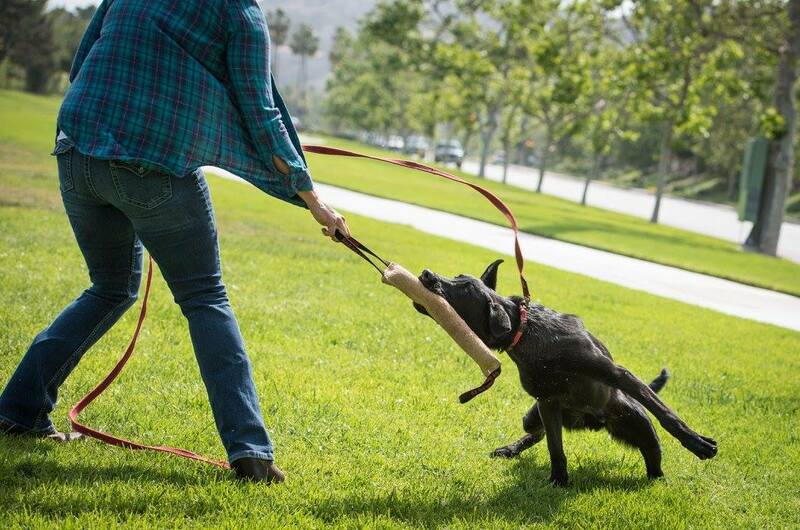 Using a LONG tug – A lot of people instinctively think that choosing a LONG tug will keep them safer, but think of this – when a dog pulls back in tug, and they are gripping a long tug, that toy will bend in the middle making it UBER comfortable and in fact, reinforcing for the dog to pull back and thrash. To save your shoulders and your back, get a shorter tug to help your dog play more appropriately. Getting Crazy – People LOVE to play aggressively in tug. But to get the most out of your play, tug games should be quiet and calculated. Getting crazy adds too much conflict and fight to a game where the potential for conflict is already HIGH. So don’t growl at your dog. Don’t whip the tug around and give the toy big, active, and constant movements. Keep your game quiet. Keep your toy moving just enough to stay alive, but not so much that it adds stress. If you want to learn how to spot conflict in your game, click HERE. Rewarding what they DON’T like (This is a BIG one) – It is HIGHLY reinforcing for dogs to win the toy in a game of tug. So, don’t let them win when they are doing something you don’t like. Now, this might seem like a simple concept and you may be thinking, “Duh Meagan. I know that already.” But in practice, this is one of the most common mistakes trainers and handlers make. They’ll let the dog rip the toy from their hand mid-thrash. Or, they want their dog to drive in, yet they let them win when they pull. Whatever your ideal game looks like, get clear on it, and only reward your dog when they are giving YOU the behavior you like. Playing tug with your dog can be hugely rewarding. But if we don’t get it right, it can be frustrating and downright painful. If your dog is pulling, thrashing, missing the toy or traveling on the tug, it’s time to look at your tug handling as it’s the likely culprit. For us to be the MOST effective, we more often than not need to change our own movements to get the game right. Don’t be haphazard with your tug game. In the end, your dog, your back, and your hands will thank you! 25 replies to "Getting Strategic: The Top 5 Mistakes Handlers Make when Playing with Their Tug-Crazy Dogs"
I just thought to mention how well you write!! I love reading your blogs! Well considered and practical!! I wish I could join your class!!! Awww. Thank you so much. Made my morning! If the dog does not target well (i.e. gets to close to the handle) I make it out immediately . If my dog targets center I let her bite longer. My GSD is now 11months…his obedience is coming along nicely. However, his grip on the tug or sleeve is not optimal. He really bites into only tugs that are very soft…if I present one that is new and hard he will try to go to the end of it in order to get the softer part. Any suggestions on toughening up his mouth? I realize he is still a puppy but I have seen other dogs his age who are doing a better job. Just FYI: his toy of choice is a ball. Great question! I’d not give him the option of moving to the end of the tug by covering it with my hands. I’d also choose toys that are not too hard but are thick enough for him to fill his mouth with. Wedges and pillows are great options for this! Bite and Drive development. Can still be done at a year but the best results come when they are young. 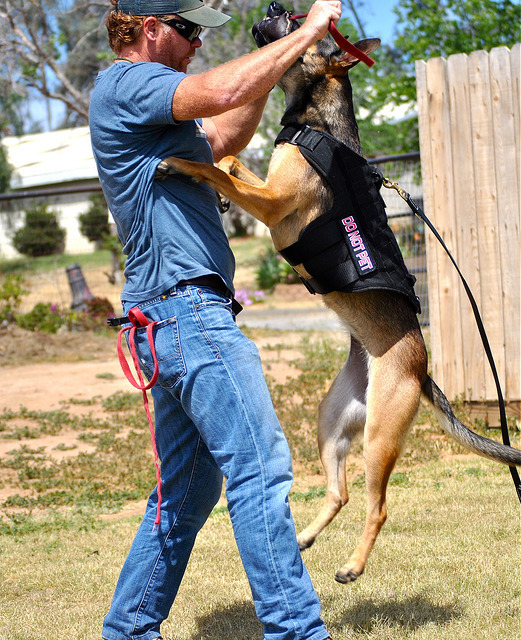 Obedience and bitework start at 5-6 weeks for most MWDs and apprehension dogs. The puppies get a few months of biting before teething and this is where “targeting” should be complete. While they are teething the tugs don’t go away, I don’t let them bite but I still present the tug/sleeve the same. Get it close enough they can feel their breathe bounce off and remove it…this really helps create the drive for the tug as they are now challenged to get it. Once teething is done your dog will have a much fuller bite, they have been toyed with for a few weeks and are as eager as ever to get the bite…instead of using the k9s up front the dog will become a full mouth biter. This will I mmedietly have an impact on grip strength as all of the teeth and proper leverage are applied. Adding to that are the proper tugs/sleeves, these will alter in size and thickness allowing the dog to start small and increase the size of the bite. Also challenging the dog towards the object. Everyone always pulls and never pushes the head. When you push the head into the object your confirming the bite and grip. Hi – I’m not sure what you mean by this: “Or, they want their dog to drive in, yet they let them win when they pull.” Are you suggesting playing tug without tugging? ..trying to figure that one out. Yep! Great question. For me, I like my dogs to PUSH on the toy, in an attempt to own it. In my opinion, it is a more empowering game for the dog if they are driving instead of pulling back and it removes quite a bit of conflict from the game. It changes the entire mindset around a game of tug. So for me, I’ll never reward my dog with a win, when the are pulling back. But some folks prefer the opposite, so they should absolutely reward based on their end goals! Another common mistake I see is people jerking the tug around and never giving the dog a chance to get a hold of it. Usually they end up getting bit because the dog can’t effectively target the tug itself. This happens a lot with our search and rescue dogs who are being rewarded not by the handler, but by someone who may not be familiar with how to tug correctly. For me, if teeth meet skin – game over at least for awhile. You do need a trainer, The mix of dog you have is a very high energy dog that does not do well being cooped up inside( even if you give them exercise I guarantee it’s not enough ).that door opens and he sees the whole world hes suoposed to be in .serious amount of exercise and training are needed now!there’s a lot you can do and work with for the dog but nothings going to work if you don’t start soon and be vigilant. I play tug with my Vizsla using either a toy or my hands. When I use my hands, I present my fore and middle fingers in a hook, so he can grab the inside of the knuckle with his fang. Doing this allows the two of us to play in a really controlled way. He knows not to bite down and only to pull. The only time it causes me discomfort is if he loses grip and his fangs slide across my fingers, but it never even scratches. It also teaches him to not whip his neck to win the tug. I feel it helps to enforce our bond. I hope I’m not wildly incorrect on this one ???? I always encourage tug to be an interactive game the “win” is playing with me not getting the toy. Obviously, that’s not every dogs “style” but I try hard to have them come back into me immediately if I let go. I want them pushing me with the toy if I give it to them (not their grip moving but shoving the toy at me saying “HEY YOU, TUG THIS!”. So the reward is the game with me & not the item. I love your articles. I wish I could afford the courses. But I still get a lot of great info and tips through your articles. When I went to training Wednesday I discussed this article with in, specifically the things I was having trouble with and knew I was doing incorrectly. I want to be a better handle. While I’m a MUCH better handler than I was when I first started, I know that the better handler I am, the better my dog will do. We too are competing in French Ring, although he already had a lot of IPO training when I got him. He already had a BH and we recently got his CSAU even though we didn’t have to mainly because I want to earn all the titles with him myself. My trainer has told me several of the things you mentioned in the article, but I was too chicken to try holding the tug so close to Bullet’s mouth. My dog is a very strong dog with very high drives. After I read your article and really understood that I needed to have a quiet and structured tug with him vs having him all amped up, AND I understood now that I needed to control the target and not the handles. I was guilty of both holding by handles only and growling and doing things to get him amped up. In my mind I thought I needed him to be amped up to give the tug more value (especially since he would much rather look at and stay with the decoy rather than come back to me. He comes back, but his attention is on the decoy. We are working on that) So I spent half of my private lesson talking about how I tug and how to utilize this info, including how to hold the tugs and my movements, etc. I am no longer holding the handles and am holding the tug correctly, even the big round one that is only about 6″ wide. I do have to use the handles on that one, but her showed me how to wedge my hands against the sides so I have control and not the dog. Those simple things have turned out tug into a quieter, focused reward session and it only took a few simple changes. Thanks for all the great articles! Thank you so much for taking the time to share your experience. This totally made my morning. I am so thrilled that you found it helpful. And awesome job putting in some really good work to improve your rewards for your dog. This is awesome! The principles applied from this article to my tug of war with my dog made that last difference from possession being the goal of my dog to the game being the fun of the activity! Holding tug with two hands made first difference. And then when I ask for the release I started with opportunity when my dog was not pulling, but kind of taking a looser hold of the toy, I then asked for the release. He did so without pulling! Really changed our game up and he is so polite about the game now! Thank you! Yeah!!!! This is so awesome. Made my evening! Love reading stories like this! Thanks so much for taking the time to comment. And keep up the AWESOME work! I’ve been doing it all wrong for 10 years. And I have the painful hands to prove it. This article means I can resume playing tug without further damage to my arthritic hands. THANK YOU! Very well written article… clear and articulate! I’ve got a 40/45 pound American Pitbull Terrier she is 2 years old and absolutely loves playing tug, she has an awesome grip. I like to pull her front legs off the ground while she’s tugging & sometimes I get her whole body hanging, now my question is, in you opinion, is that harmful to her in any way? Or is it helping her grip strength? Thanks very much. Look at this whole activity differently now! Great article and very helpfull. Do you have any tips for a dog that tends to bite over the sleeve missing it completely the first time and then biting a second time to get the sleeve. I cannot figure out why my dog is biting high or how I can correct this. She is a GSD 8 month old pup in a protection training class and my trainer has no solution….. Learn how to use tug play more effectively in your training!